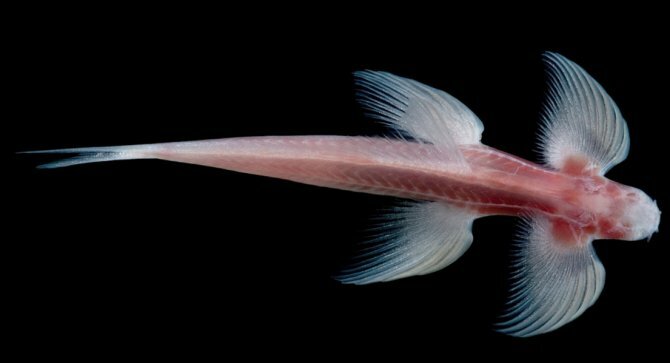 New fish walks on land using its fins like legs! Aquarists will be familiar with a number of fishes able to move about on land, but scientists have recently discovered one that throws a new light on understanding how terrestrial vertebrates evolved. Mudskippers, snakeheads and Climbing perch are all examples of modern fishes with some ability to walk. But they all use their front (pectoral) fins as props or pivots while the actual force that pushes them forwards comes from their tail, a mode of locomotion completely different to that used by the terrestrial vertebrates: amphibians, reptiles, birds and mammals. These rely on two pairs of limbs, and so this group of vertebrates is known as the tetrapods, or four-footed animals. So while it’s interesting to observe the way mudskippers move about, it doesn’t really tell us anything much about the evolution of walking in tetrapods. That meant that scientists trying to explain how tetrapods evolved from fishes had to rely on fossils that were more than 380 million years old. But now, thanks to a bizarre cave-dwelling loach, they can actually see a four-footed fish in action! Cryptotora thamicola is a balitorid, a member of the hillstream loach family often kept in mountain stream biotope aquaria. But rather than streams it lives in the limestone caves dotted across a certain part of Thailand. Despite its subterranean habitat it’s still lashed by severe water currents, and has to climb over rocks or even up waterfalls to get from one bit of water to the next as it forages for food and living space. Like other balitorids it has very large pectoral and pelvic fins that help it 'grip' onto solid surfaces and keep it from being washed away by the current. But where this little loach differs from its relatives is in having heavily calcified pectoral and pelvic girdles; in other words, shoulder blades and hip bones much more similar to those of a tetrapod than a fish. Not only are these bones more robust than in other fishes, they also have stronger muscles and firmer attachments to the backbone. When scientists studied how Cryptotora thamicola moves about, they discovered that its unusual skeleton didn’t just look similar to that of tetrapods, it was being used in the same sort of way. Instead of the body and tail bending into an S-shape as you’d see in snakeheads for example, the body was more or less straight while the fins operated in concert. As the left pectoral fin reached forward, the right pelvic fin would move forward at the same time; the next 'step' had the right pectoral reaching forwards alongside the left pelvic fin. Crucially, and unlike any other modern-day walking fish, the tail wasn’t used to push the loach forwards at all. In short, it was using its fins just like legs. Of course nobody is suggesting Cryptotora thamicola is evolving into a land animal or that it’s a missing link between fish and tetrapods. But what it does do is reveal how primitive tetrapods might have worked, and the type of walking gait it exhibits matches fossil trackways from the Devonian Period that are believed to have been made by a very primitive tetrapod of some sort. Fossils can tell you a lot about the bones, muscles and even the footprints of long-extinct organisms, but only a living animal can show how all the different parts of an animal worked together, and that’s exactly what Cryptotora thamicola does.